Cuba Gooding Jr. rushes SAG stage, wishes all a “Happy MLK weekend! To cap off a night of surprises, Cuba Gooding Jr. rushed the stage at the end of the 20th Annual SAG Awards. But what inspired the star from The Butler to blitz Ben Affleck? The 20th Annual Screen Actors Guild Awards weren’t without a few surprises. In the Outstanding Performance by a Female Actor in a Television Movie or Miniseries category, Helen Mirren snagged the statue from front-runner Elisabeth Moss. Ty Burrell dashed Alec Baldwin’s dreams of an eight-peat. And Rita Moreno dropped the F-bomb during her Lifetime Achievement acceptance speech. 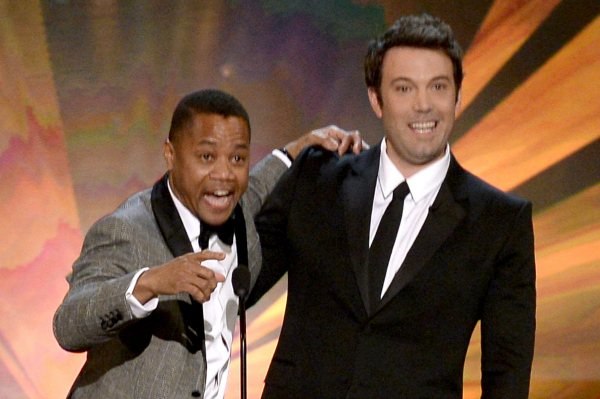 But perhaps the biggest surprise of the night came courtesy of Cuba Gooding Jr. — just ask Ben Affleck. Shortly after presenting the Best Ensemble award to the cast of American Hustle, Affleck was hurrying to eke out his closing spiel when Gooding unexpectedly rushed the stage. While Gooding’s sentiment was nice, his frenetic approach was a bit puzzling. Poor Ben Affleck was caught completely off guard, and the entire scenario felt a little too Kanye West, if you ask us. Still, the giddy actor’s heart was in the right place. What do you think? Were you confused by Cuba Gooding Jr.’s last-minute holiday greeting?